Xenon (its name derived from the Greek word xenos , meaning "strange"), is the heaviest of the noble gases . Discovered in 1898 in London by Sir William Ramsay and Morris Travers while engaged in their investigations of liquid air, xenon accounts for less than 1 ppm of the volume of Earth's atmosphere. It is present in the Sun and in the atmospheres of Mars, Venus, and Mercury. 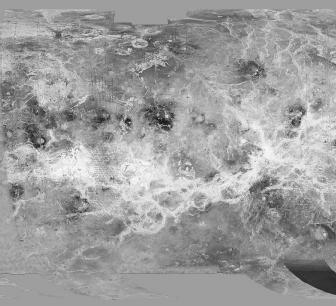 The gas xenon is present in the atmosphere of Venus. SEE ALSO Noble Gases . Lide, David R., ed. (1996). CRC Handbook of Chemistry and Physics , 77th edition. Cleveland: Chemical Rubber Company Press. Jefferson National Laboratory. Available from http://education.jlab.org/glossary/abund_atmos.html . NASA's Cosmic and Helioscopic Learning Center. Available from http://helios.gsfc.nasa.gov/nucleo.html . "The Nobel Lecture of Sir William Ramsay." Nobel e-Museum. Available from http://www.nobel.se/chemistry/laureates/1904/ramsay-lecture.html . WebElements Periodic Table. Available from http://www.webelements.com/webelements/elements .